Bitdefender or Kaspersky, which antivirus software is a better choice in 2019? Read this in-depth, data-driven comparison to make a smart decision. 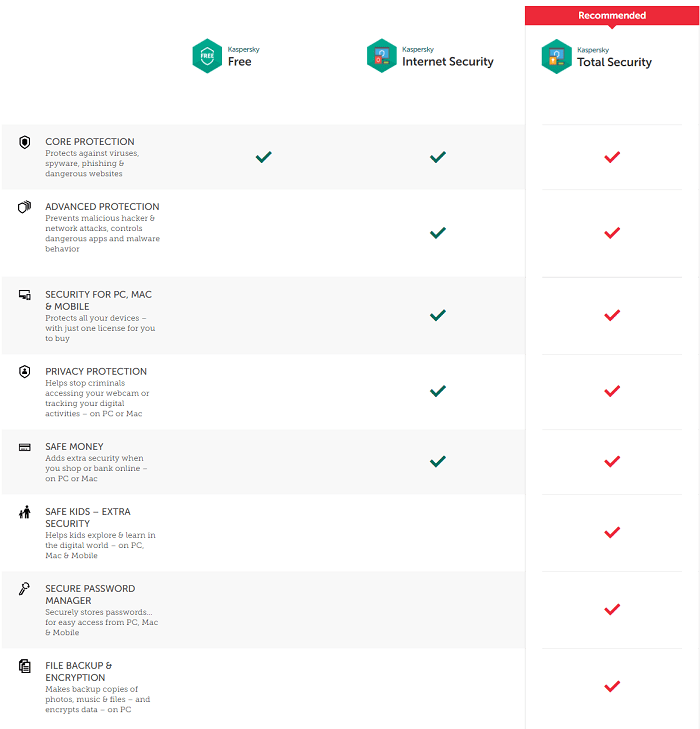 In this comprehensive Bitdefender versus Kaspersky comparison, you’ll see what’s included in different antivirus suites both companies offer, as well as how both software compare in terms of malware protection, impact on system performance, user interface, cost, and more. In the digital world, you should take extra measures to make sure your data and privacy are in good hands. Do you the AV-Test security firm — an independent security laboratory — catches over 350,000 new malware samples every single day? The frequency at which malware attacks are happening these days is alarming. Needless to say, if you don’t invest in a reliable security suite to protect your internet-capable devices (computers and smartphones, in particular), you could find yourself in a lot of trouble down the road. Hackers are coming up with new (and clever) ways to steal your data, breach your privacy, corrupt your system, drain your bank, and more. Luckily, most premium antivirus software automatically update their products several times a day with new malware definitions, providing immediate protection against the latest digital threats. “I already have Windows Defender on my computer,” you might say. Well, the biggest downside of using free or low-cost antivirus programs is that they usually offer limited malware protection with no additional security-enhancing features or extra utilities. For these reasons, experts say that Windows Defender won’t keep you safe. Therefore, we strongly urge you to invest in a premium antivirus suite for all-round malware protection and complete peace of mind. First, let’s see the security suites both companies offer. If you’re in a rush and want the answer right away, take a look at the graphic below and also read our short verdict to make your mind. Bitdefender offers more security-related features and utilities in its security products than Kaspersky. Independent tests prove that both software provide excellent protection against all sorts of malware threats, but Bitdefender is better than Kaspersky in terms of the impact on system performance. First, let’s review the Bitdefender’s suites that are compatible with the Windows platform. The company’s entry-level product is Bitdefender Antivirus Free. Unlike other antivirus companies, Bitdefender doesn’t include a lot of features and utilities right in its freeware; it only offers essential anti-malware security and also guards against phishing/fraudulent websites. A Home Scanner, which is available as a free separate download, checks your Wi-Fi network for vulnerabilities and also protects against hackers and intruders. For secure browsing experience, Bitdefender offers a Traffic light browser extension; it has an advanced malware filter, a link scanner, a trackers’ identifier, and also protects against phishing attacks and online fraud. It supports Chrome, Firefox, and Safari. Next in the line is Bitdefender Antivirus Plus 2019. Along with everything included in the freeware, it offers multi-layered ransomware protection, a WiFi Security Advisor (monitors your router and improves network security), a hardened browser for safer banking/shopping activities, a Search Advisor (finds out whether search results are safe or not), and a password vault. Additionally, a vulnerability scanner (checks for security flaws and other related vulnerabilities), an autopilot feature (makes optimal decisions without annoying you), a file shredder, and a battery saver are also included in this suite. And, as you might have guessed, you’ll also get free online 24/7 support as a paying customer. Another level up is Bitdefender Internet Security 2019. It adds a two-way firewall, a file encryption utility, a Safe Files feature (shields your important files from ransomware), and a limited VPN. Webcam protection and parental control features are also part of the “Internet Security” suite. 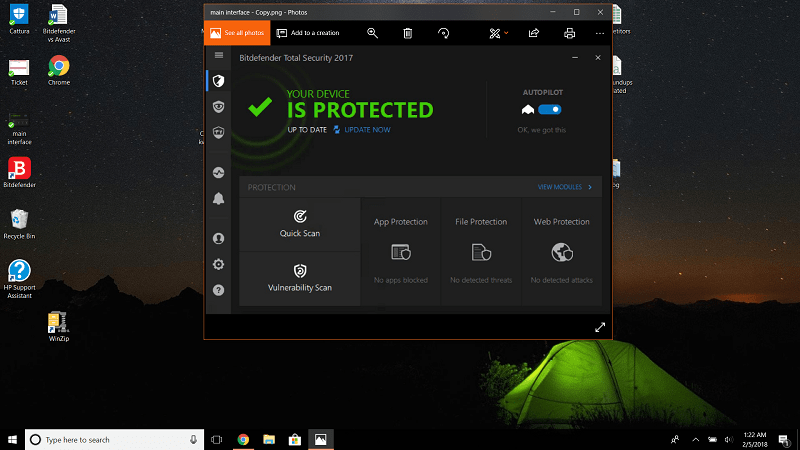 Bitdefender Total Security 2019 is the company’s top-of-the-line suite, boasting several performance optimization tools (including OneClick Optimizer, Disk Cleanup, and Startup Optimizer), along with everything included in the “Internet Security” plan. A useful anti-theft module (helps you find lost or stolen devices) and an autopilot feature (makes optimal decisions without annoying you) are also included in this suite. If you’ve got a lot of devices to protect in your household, go with Bitdefender Family Pack 2019. It protects unlimited family devices and includes all the features jammed into the “Total Security” suite. Now, let’s see what Bitdefender offers for Mac users. Much like its Windows-only freeware, Bitdefender offers a limited Virus Scanner for Mac. It comes with essential anti-malware security (protects against viruses, spyware, and other online threats) and also allows you to run different types of scans; you can scan running apps, any specific file/folder, or the entire system. For advanced protection-related features and extra utilities, you’ll have to upgrade to Bitdefender Antivirus for Mac. It offers comprehensive protection against all kinds of malware (including ransomware), blocks annoying adware, protects your backups, and also secures your browsing experience. Note: Bitdefender Total Security 2019 and Bitdefender Family Pack 2019 both are compatible with Macs, too. What is Included in Kaspersky’s Antivirus Suites? Kaspersky Free — which released in July last year — is the company’s entry-level product. Along with providing basic-level protection against malware, it checks for dangerous email attachments, steers clear of dangerous websites, and also protects against phishing attacks. A useful on-screen keyboard is also there in the freeware to prevent keyloggers from stealing your sensitive data. If your computer is so infested with malware that it just won’t start up, you can make use of Kaspersky’s free rescue disk to remove deep-rooted malware infections. However, you should consider upgrading to a premium plan (perhaps Kaspersky Total Security) as the best paid suites outperform the free ones. Next up is Kaspersky Anti-Virus. It adds a game mode feature (minimizes notifications for uninterrupted experience), a vulnerability scanner (scans for outdated software and vulnerabilities in your operating system), and also adds protection against ransomware (a type of malware that steals or blocks access to your important data unless you pay a ransom amount). Another level up is Kaspersky Internet Security. It adds a two-way firewall (monitors network traffic and blocks attacks), a hardened browser for safe banking/shopping, and also includes webcam and microphone protection. A basic-level parental control filter is also part of the ‘Internet Security’ plan. It prevents your kids from seeing inappropriate content and also helps you manage their social media usage. 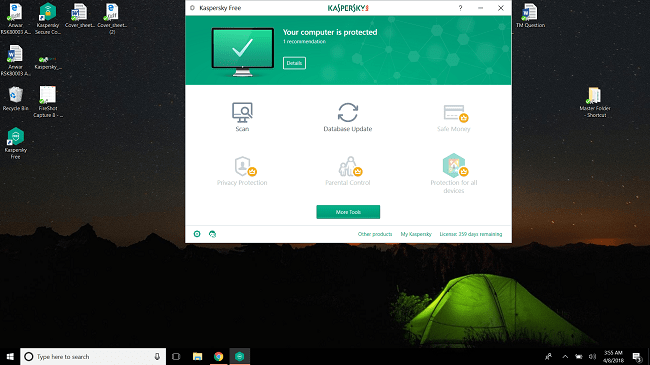 Kaspersky Total Security is the company’s top-tier suite, adding a file shredder (enables you to securely delete your sensitive files so no one can recover them), an unlimited password manager, and an automatic backup tool (with 2GB of online space). A more advanced parental control filter and a file encryption utility is also included in the ‘Total Security’ suite. Note: You can protect all your devices (PC, Mac, and mobile) with a single subscription of both Kaspersky Internet Security and Kaspersky Total Security. The bare-bones Virus Scanner for Mac is the company’s free offering for Mac users. It includes an on-demand scanner (checks for various types of malware threats) and also offers detailed reporting on different threats. The Virus Scanner Pro adds a download scanner (automatically scans your ‘downloads’ folder for malware) and also gives you step-by-step instructions on how to remove various types of malware threats. To get proactive protection and other advanced tools and utilities, you’ll have to go with either Kaspersky Internet Security or Kaspersky Total Security – both of which are compatible with Mac platform. Bitdefender vs Kaspersky: Which Offers Better Malware Protection? There are two kinds of malware threats: known malware (or widespread malware) and unknown malware (also called zero-day malware). The former refers to the type of malware that is already out in the wild (i.e. its digital signatures are already available), while the latter type of malware exploits a previously unknown vulnerability and doesn’t have an exact signature match, which means antivirus programs have a difficult time catching it. Usually, antivirus software employ signature-based scanning (checking suspected files against a huge library of known malware) and heuristic monitoring (checking for behavioral attributes of suspected files) to detect unknown malware. Let’s see how Bitdefender and Kaspersky fared in the recent lab tests conducted by AV-Test and AV-Comparatives – two independent security institutes that regularly assess various antivirus products on different levels. Similar tests were conducted on Windows 10 platform in November and December last year. Bitdefender once again came up with perfect scores; it thrashed 100% of both types of malware samples in both months, earning another 6/6 star rating. Kaspersky’s results in Windows 10 evaluations weren’t as great as its Bitdefender’s but it still managed a perfect 6/6 rating; it blocked 100% of widespread malware in both months, but only picked up 98.9% of zero-day malware in November and 100% in December. 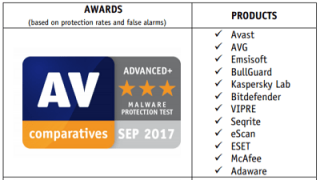 To thoroughly examine the defenses of various antivirus products, AV-Comparatives conducts two major tests: malware protection test and real-world protection test. The latter — as the name suggests — tests a product against a large number of real-world malware samples with their default settings in place, while the former assesses a security program’s on-demand scanning, on-access scanning, as well as behavioral detection capabilities. AV-Comparatives most recent real-world protection test report included average results of the tests conducted in five consecutive months, from July to November 2018. Both Bitdefender and Kaspersky were awarded the highest accolade, which is the “ADVANCED +” award, courtesy their near-perfect 99.9% and 99.7% protection rates, respectively. Bitdefender registered 3 false positives (i.e. misidentifying legitimate files or domains as malware-infected) over the five-month period, while Kaspersky returned only 2. AV-Comparatives’ malware protection test was most recently held in September last year. Both Bitdefender and Kaspersky once again received the “ADVANCED +” award because of their near-perfect protection rates of 99.95% and 99.96%, respectively. Kaspersky returned 10 false positives in this test, while Bitdefender came up with only 5. Overall, it can be said that Bitdefender and Kaspersky both offer excellent protection against all types of malware. Bitdefender vs Kaspersky: Which Software Puts Less Impact on System? Antivirus program – like any other software – needs some percentage of system resources to do their job. A security software that provides excellent malware protection but consumes too much of resources is not necessarily a good option. To find out how much impact Bitdefender and Kaspersky put on system performance, I will once again look at the independent lab test. AV-Test’s protection test involves determining the impact a product puts on computer performance; they execute few common computer operations, such as downloading/installing software, browsing websites, copying files, and measure the slowdown caused by a security product on a standard and a high-end PC. Here’re the results of the test with Bitdefender installed. Here’s how Kaspersky fared in the test. As you can see, both software received a perfect 6/6 star rating. Note: These tests were conducted on Windows 10 platform in November and December 2018. The results were exactly the same when AV-Test conducted the same study on Windows 7 platform a little more recently, in January and February 2018. The experts at AV-Comparatives do a similar study; they also execute few common computer tasks and check the impact a security software exerts system in terms of impact score (the lower the better). In their recent study — which was held in September 2017 – both software were awarded the highest “ADVANCED +” award, but Bitdefender received a better impact score of 4.1, as opposed to Kaspersky’s slightly heavier 8.1. So, it’s clear that both software are extremely light on system resources and none of them will significantly degrade your system performance. But it must be said that Bitdefender is slightly better than Kaspersky in terms of system performance. Bitdefender vs Kaspersky: Which Software Offers a Better Interface? Kaspersky’s interface is bright, clean, and simple. The default page – despite having a lot of features and useful links – doesn’t look crowded or clunky. 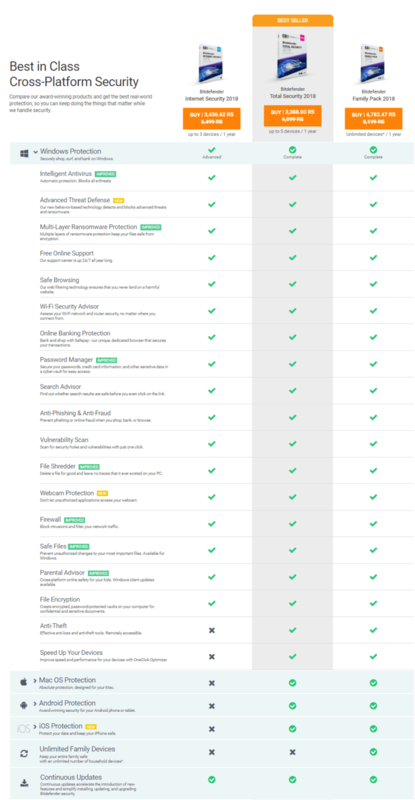 At the top, you’d find a green banner and a reassuring “Your Computer is Protected” message next to a checkmark provided your computer’s health is okay. The banner quickly turns to red when there’s an issue that needs your immediate attention. Scan, Database Update, SafeMoney, Privacy Protection, Parental Control, and Protection for all devices are the six modules you’ll find on the main window. Each module is self-explanatory and contains relevant features and their settings. At the bottom, there’s a horizontal menu that has links to settings, news, support, and more. Also, it goes without saying that if you’re using the freeware, most of the advanced security-related features and extra utilities will not be available to you. Bitdefender offers two interfaces; one for the freeware and the other for its premium products. The interface for the free version is very simple and minimalistic. Other than a “Scan Computer” button on the main window which you can use to run a full computer scan, there aren’t any features that you can access or settings that you can control. Bitdefender’s premium products come with a more featured and robust interface. There’s a vertical menu on the left which consists of the following tabs: Protection, Privacy, Tools, Activity, Notifications, Account, Settings, and Support. Protection window — which is also the default view — shows your protection status, contains a toggle switch to turn autopilot feature on/off, and also has buttons to run a quick scan or a vulnerability scan. Information about different types of threats Bitdefender has thwarted in the last 30 days is also available on this window. Privacy and Tools pages contain relevant features and their settings. The rest of the tabs are self-explanatory. The name of the suite you’re subscribed to is displayed in the title bar. At the bottom, there’s a link which takes you Bitdefender’s online portal where you can manage all your devices at one place. So, it’s clear that Kaspersky’s products come with a lot simpler and easy to use interface than Bitdefender’s (the one for the premium products). Bitdefender vs Kaspersky: Which Software is More Expensive? As you can see, Bitdefender’s suites are a touch expensive that Kaspersky’s. Bitdefender vs Kaspersky: Which Software is More Popular? Bitdefender and Kaspersky are among two of the most popular antivirus companies, but which one of them is ahead of the other in terms of popularity? I’ll look at independent antivirus market share statistics and social media influence of each software product to declare a winner in this category. According to OPSWAT – a company that publishes monthly reports on the market share of leading antivirus companies – Avast is the most used antivirus product with a total market share of 19.64%. Bitdefender is fifth on the list, boasting a market share of 6.82%, while Kaspersky is last in the line with only 3.86% market share. Speaking of social media influence, Bitdefender has 4.1 million Facebook fans and 82K Twitter followers, while Kaspersky’s Facebook tally is just over 3.3 million and Twitter’s nearly 300K. Overall, both products are extremely popular among the antivirus user community but Bitdefender captures a bigger market share. Both Bitdefender and Kaspersky offer several excellent premium suites to match your protection needs. I have had Kaspersky Total Security for several years and paid $49.99 per year. However, you should note that Kaspersky increased the cost in 2019 to $84.99 for the same protection suite. Thinking of switching to Bitdefender!